CNA's James Hollis talks to TVZ about newsgathering. 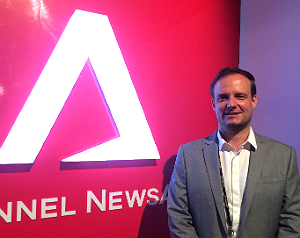 Based in Singapore, Channel NewsAsia has been broadcasting news to the region for the past 15 years. Since going on air, it's expanded and opened bureaus in major Asian cities and now employs about 250 editorial staff. Q: In which countries does CNA have bureaux? How has this number grown since the channel first went on air in 1999? A: Malaysia, Indonesia, Thailand, the Philippines, India, China, Hong Kong, Japan, Korea, Taiwan and Myanmar. We opened 8 regional bureaus by 2006, and Yangon, which was officially launched In January 2014 is our 13th dedicated bureau. Q: How does CNA transmit its live and packaged reports from the bureaux to the broadcast hub in Singapore? A: The bureaus around Asia are all running on IP-based video codecs. However the way we transmit is somewhat dictated by the local infrastructure. Some areas, say Hong Kong for example, have a reliable and cost-effective IP infrastructure; other sites such as Myanmar are not so advanced as yet. For our “live” news we use a mix of either leased lines or ‘public internet’. Leased lines, of course, give greater stability, but they come at a cost. However, with advances in encoding and streaming technology there are many manufacturers offering new methods of transferring the data giving lower bit rates for HD transmission plus better handling of packet loss. Even public internet now can deliver good service if managed correctly. Packaged reports from the bureaus are sent using FTP. Our correspondents trim down the visuals to only the critical portions to speed up the transfer process. Q: How have transmission methods from the bureaux changed over the years? A: All our bureaus now use IP-based transmission. Historically these could have been fibre, ISDN, ATM networks or satellite. IP video transmission has been around for many years and it continues to develop as the encoding becomes more efficient, bandwidth becomes cheaper and more reliable and error correction evolves. Only more recently have we seen or had the confidence in using this technology for 24/7 transmission which requires 100% reliability. As the encoding technology develops, transmitting HD quality signals at less than 1mb is becoming a reality. If you compare this to running HD-SDI over fibre the cost is considerably less. Q: Do you use an off-the-shelf IP transmission system or have you designed your own system in-house? A: There are so many manufacturers now with IP encoding/decoding technology that developing in house is no longer required. Step back 10 years ago and the landscape was very different, even then developing your own was costly. We use off-the-shelf systems from various manufacturers including Livewire, Streambox and LiveU. As with all media organisations, we continually look at the latest technology as there are always new ways of carrying out the encoding/decoding and managing data loss (with FEC, forward error correction for example). Q: Does CNA own SNG trucks and how important are they to its newsgathering operations? A: Channel NewsAsia used to avail itself of the SNG belonging to its parent company, MediaCorp. However, this SNG has since been decommissioned. We do however still use SNG on an ad hoc basis as there are still situations when it is the best option. 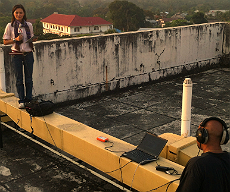 We recently launched our Channel NewsAsia office in Myanmar for which we flew in a SNG kit for the opening events. This decision was based on the need for a quality and reliable signal, and there being limitations on the local infrastructure. Overall SNG usage has drastically decreased in significance as new methods of delivering live content have evolved over the last decade. Delivering content over mobile networks such as bonded cellular (3G, 4G) being one of the key developments. Q: What effect have cellular networks had on CNA's newsgathering operations? A: Overall the impact of cellular networks has been very positive. It is simpler than using satellite uplink for example, and in theory more cost effective. Using bonded cellular methods (basically multiple SIM cards) you can run good quality video over 3G and 4G networks. This technology is developing fast and there are now numerous systems which allow newsgathering with this method. You compare this historically with using microwave (which needs line of sight) or BGAN (which requires a small dish to uplink) or SNG, cellular networks are allowing us to do more due to the lower cost and ease of use. However, there are limitations. Firstly, it is not always reliable, as you are sharing the network with all other users and at times you cannot get a strong enough signal to transmit at the bit rate you require. Additionally, not all countries are the same, particularly in Asia where you may have good 3G/4G coverage in one country but across another border you have very little. Then you have to rely on BGAN or back to SNG. Q: Which broadcast cameras does CNA favour for its video journalists and why? A: For our newsgathering, we use Panasonic P2HD cameras, mainly due to ease of use and reliability of the P2 format. P2 uses cards, similar to large SD cards to store the video and audio data. These are robust and record in a format (MXF) which is widely accepted. As there are no physical moving parts, reliability is high. We are however keeping a close eye on cameras with IP connectivity allowing data transfer over FTP via either wifi or broadband and even live streaming. We also have access to other cameras, whether this be Sony F5 or Canon 5D. These tend to be used more on our current affairs or documentary programming. Q: Has new technology enabled CNA to reduce its expenditure considerably on satellite feeds from the bureaux? software with uplink via BGAN terminal. A: With 13 bureaus around Asia the cost to connect all of these on fibre or satellite would be extremely high and as such we would have to be very selective. Using IP delivery is considerably cheaper allowing us to connect all of our sites for minimal expenditure. Most companies will already have an existing IP network to run their desktop computers and internet based usage. All we are doing is expanding on this rather than using different technology for broadcast. Of course, we separate the networks to ensure stability. The technology allows us to deliver news content direct from these regions improving the depth of our coverage. In turn, we can be smarter with our news-gathering, doing more, with faster and better quality. Q: Which technologies is CNA currently investigating to further enhance its newsgathering operations? A: Everyone has the potential to be a cameraman/reporter now with cellphones becoming more and more powerful. Among other things, we are in the midst of rolling out live streaming applications from cellphones which would allow all staff to basically be able to feed live video streams if they are at a newsworthy event. In addition, live video feeds from drones which we can remotely fly over areas/events could give us a unique view. We have used these for some of our current affairs programmes. 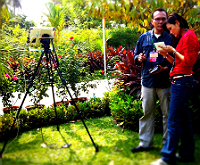 We have to research on how to enhance news gathering with this technology.